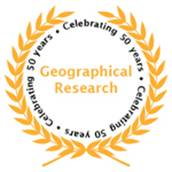 I am refreshing the list of book reviewers for Geographical Research (Journal of the Institute of Australian Geographers). I currently have a number of books available for review for GR. There are also some very interesting books scheduled for release in 2015 that I will be seeking reviewers for. Reviews are typically 1200 words in length and reviewers have three months to complete their review (after they receive a hard copy of the book). If you are interested in reviewing a book for GR please send me an email noting the 'topics' you are interested in, your current position and publication experience.